Shawn Corey Carter (born December 4, 1969), known by his stage name Jay-Z (sometimes styled JAY Z), is an American rapper, record producer, and entrepreneur. He is one of the most financially successful hip-hop artists and entrepreneurs in America. In 2012, Forbes estimated Carter's net worth at nearly $500 million. He has sold approximately 50 million albums worldwide, while receiving 17 Grammy Awards for his musical work, and numerous additional nominations. Consistently ranked as one of the greatest rappers of all time, he was ranked number one by MTV in their list of The Greatest MCs of All-Time in 2006. Three of his albums, Reasonable Doubt (1996), The Blueprint (2001), and The Black Album (2003), are considered landmarks in the genre with all of them featured in Rolling Stones list of the 500 greatest albums of all time. As an entrepreneur and investor, Jay-Z co-owns the 40/40 Club, and is the co-creator of the clothing line Rocawear. He is the former CEO of Def Jam Recordings, co-founder of Roc-A-Fella Records, and the founder of Roc Nation. He also founded the sports agency Roc Nation Sports and is a certified NBA and MLB sports agent. As an artist, he holds the record for most number one albums by a solo artist on the Billboard 200 with 13. 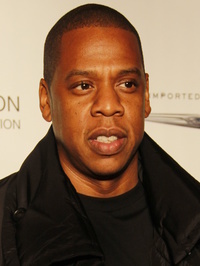 Jay-Z also has had four number ones on the Billboard Hot 100, one as lead artist. On December 11, 2009, Jay-Z was ranked as the tenth-most successful artist of the 2000s by Billboard as well as the fifth top solo male artist and fourth top rapper behind Eminem, Nelly, and 50 Cent. He was also ranked the 88th greatest artist of all time by Rolling Stone. This webpage uses material from the Wikipedia article "Jay-Z" and is licensed under the GNU Free Documentation License. Reality TV World is not responsible for any errors or omissions the Wikipedia article may contain.